Pharmacist Bob Listecki is a second generation pharmacist from Chicago. Graduated from Campion Jesuit High School in Prairie Du Chien, Wisconsin and the University of Wisconsin College of Pharmacy. After serving as Chief of Pharmacy Service General Leonard Wood Army Hospital and Pharmacy Officer for 40,000 member Fort Leonard Wood post, returned to the family business in Des Plaines and Glen Ellyn. Was awarded a position in the Community Pharmacy Management Program at the University of Mississippi in 1992. This was a competitive application known as the Apple Program to foster business planning in community pharmacy. 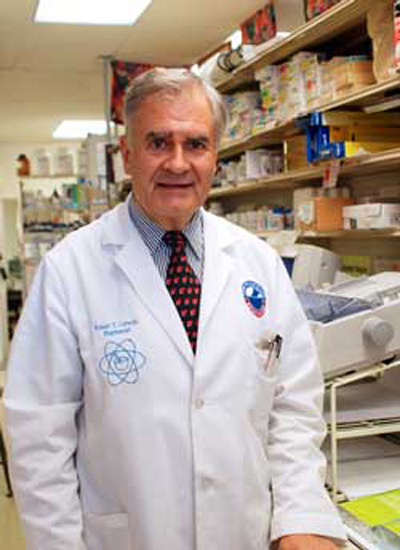 Bob was active in the Village of Oak Brook, DuPage County pharmacy and business organizations, and Illinois and National pharmacy organizations. Awards: Daniel B. Smith Award from American Pharmaceutical Association for outstanding performance and achievement, both in the community and professional practice setting a National Award 29th recipient. Adjunct Instructor at six College of Pharmacies for 24 years. Eleven publications, Progesterone and Thyroid protocols in the International Journal of Pharmaceutical Compounding, 2001 and 2012, Annals of Pharmacotherapy 1996 Attitudes of Hypertensive patients/ The Pharmacist as one information provider. Sailed Chicago Mackinac Yacht Races for 37 years winning overall in 2004.